daily dose of spazz: Are you Illin'?? Well, earlier this week I woke up with that "scratchy throat, oh no, I am going to be sick" feeling. So, I rushed to the store for one of my favorite beverages Vitamin Water. This stuff rocks! I kid you not, two days later, not even a hint of impending illness. With the Power C, I had outsmarted that pesky little virus and was as good as new. So check them out! Their Website is ubercool. Check it out www.drinkbetterwater.com. 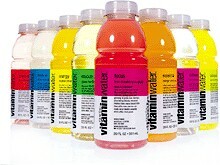 Until then, get yourself some vitamin water and feel better!